Summary: A quite satisfactory statement that suggested this London-dependent estate agency should be able to cope with the capital’s slower property market. Indeed, the business appears keen to expand and the pace of its new franchisee openings may in fact accelerate. Margins remain high, the balance sheet remains strong and a P/E of 7 seems to price in a lot of bad news. I bought more shares in August and continue to hold. I suppose WINK’s statement could have been a lot worse. Rival London estate agent Foxtons (FOXT) issued a profit warning a few days after the EU referendum and worries about a slowing housing market in the capital have dogged WINK’s shares ever since. In the event, WINK’s figures were not too bad. Bolstered by a bumper first quarter, during which buyers completed transactions ahead of new stamp-duty rates, WINK’s revenue gained 7% to £2.75m. Commissions from property sales gained 5% while lettings-related income climbed 11%. I note lettings-related income now represents 40% of total revenue, up from 33% two years ago, and is closing in on the group’s 50% target. WINK admitted it experienced a “slowing sales market” during the second quarter, although the firm expects trading to “pick up from the lows of June and July” and therefore is confident that it can “perform satisfactorily during the current financial year”. Past years have seen some 80% of revenue emanate from the group’s London-located franchisees, although WINK is not too dependent on scarce buyers of prime Zone 1 properties. Earlier this year, the group confirmed the average property sale price throughout its offices was £645k. Interestingly, WINK added that rental applications were up 40% year-on-year in July, so giving the firm a “strong start” to the second half (at least in the lettings division). “A further two new offices were opened in Colindale and Marlborough, while three existing offices were resold to new management. One office in the UK and two in Portugal were closed. Over the coming six months we anticipate a further 6-8 new openings and a further 1-2 resales, while longer term we expect to see an increase in opportunities both to convert existing businesses to the Winkworth brand and to grow new franchises. Hopefully the new man will indeed kick-start an enlarged franchise network. Following WINK’s flotation during 2009, the firm’s network has grown slowly, from 86 to only about 100 branches today. WINK’s relatively upbeat view on expansion contrasts with FOXT, which said within its July results that it was “reviewing the pace of our branch openings over the short term and may slow the pace of expansion in response to market conditions”. Despite WINK spending an unspecified amount on an office move, the first-half operating margin still increased a fraction to a robust 25%. WINK’s cash position dropped by £0.3m to £2.8m during the six months as the business appears to have loaned up to £0.7m to new franchisees. The rest of the cash generated was effectively paid out as dividends. I noted in March that WINK does earn respectable sums from these loans to franchisees. This half produced interest of £34k, which seems light compared to last year’s £47k, but nonetheless represented 5% of the overall pre-tax profit. WINK’s operating profit for the year to June 2016 was close to £1.9m, which after 20% standard tax gives earnings of £1.5m or 11.9p per share. Adjusting the £14.6m (at 115p) market cap for my £4.0m estimate of cash and franchisee loans, I arrive at an enterprise value of £10.6m or 83p per share. 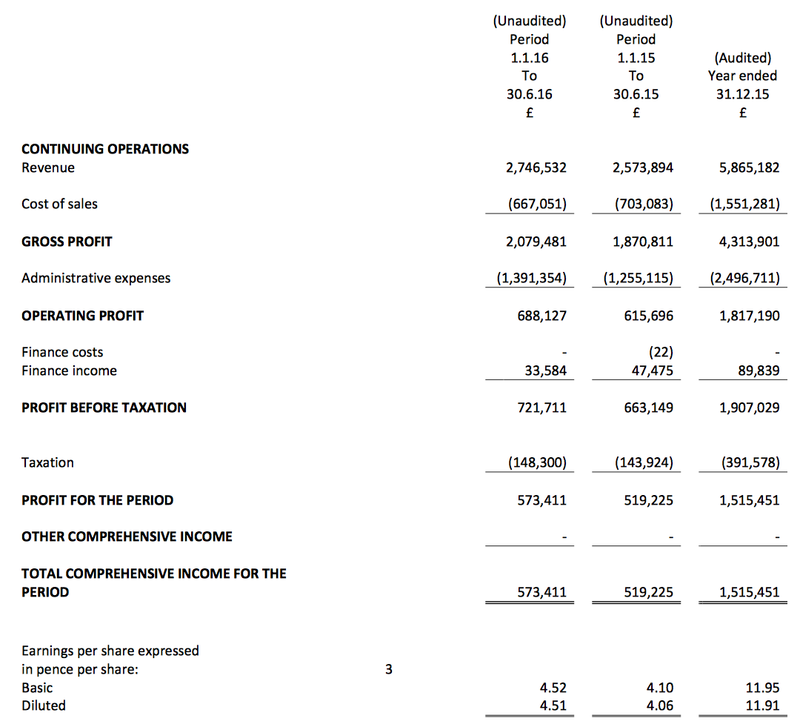 Then dividing that 83p by my 11.9p per share earnings guess gives a P/E of just 7. Meanwhile, the trailing dividend is 6.9p per share and supports a 6% income. 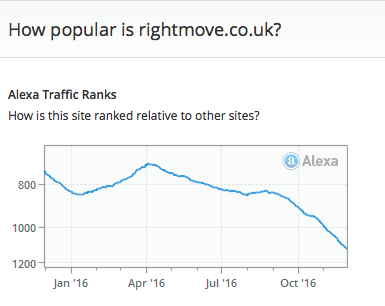 Even with a fragile housing market in London — plus the risk perhaps of online competition — those ratings appear very good value to me. So much so, I must confess to buying more WINK shares last month. I increased my holding by 43% and paid 110p including all costs. This entry was posted in M Winkworth, My Shares and tagged M Winkworth, WINK on September 14, 2016 by Maynard Paton. In our interim statement we referred to ongoing economic uncertainty, but noted that trading was expected to pick up from the lows of June and July and that transactions in the country and suburban London markets were expected to return to growth in the latter part of the year. At that point, stock levels across the industry were low as sellers waited for greater visibility before marketing their property. Since that time we have seen purchasers returning, albeit at a lower level than this time last year, and a moderate upturn in sales. Uncertainty continues to weigh on transactions, however, as some sellers withdraw from the market with the intention of reviewing their situation in 2017. Meanwhile, we have seen rental prices softening in line with an increase in supply of properties following the surge in buy-to-let purchases prior to the rise in stamp duty in the spring. We do not expect to see this dynamic changing in the immediate future. As a result of the slower than anticipated level of activity over the autumn, both sales and full year profits are likely to be moderately below market expectations. We are today, nonetheless, declaring an increased dividend for the third quarter of 1.8p and the full year ordinary dividend payment will once again be ahead of the previous year. Going into 2017, we continue to anticipate a further 6-8 new openings and a further 1-2 resales, while longer term we expect to see an increase in opportunities both to convert existing businesses to the Winkworth brand and to grow new franchises. So perhaps 2016 earnings could be about 9p per share. I should add that WINK provided a subdued update this time last year, and it transpired the group enjoyed a buoyant December and the 2015 figures were actually better than expected. That said, WINK’s references to the “long-term outlook for the Company” does suggest the short- to medium-term outlook could be somewhat cloudy. Anyway, assuming earnings are 9p per share, my quick sums based on the Valuation numbers fem the Blog post above give a cash-adjusted P/E of 8.7x at a 110p share price. The announcement of a Q3 1.8p per share dividend means the 12-month payout is running at 7.1p per share and supports a 6.4% income. 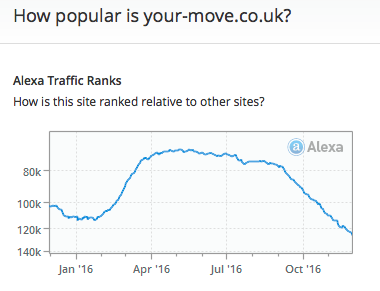 There is without a doubt more activity now than there has been since Brexit. On 13 September 2016, options over 0.5p ordinary shares in M Winkworth plc (the “Company”) were granted to Dominic Agace, Chief Executive Officer of the Company. The options are exercisable at a price of 200 pence per share with effect from 13 September 2019. Clearly WINK will have to go some for the chief executive to enjoy these options when the current share price is 110p and the business appears to be committed to at least sustaining a hefty 7.2p per share dividend. That said, I do like these types of options, which are defined by an exercise price much higher than the present share price. Clearly the board felt 200p ought to be achievable at some point. 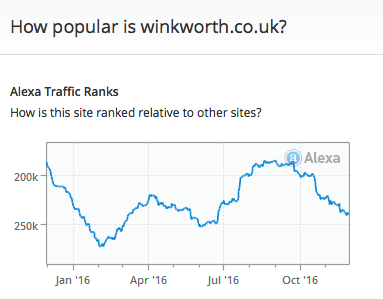 I occasionally visit Alexa.com to check on website traffic to winkworth.co.uk. 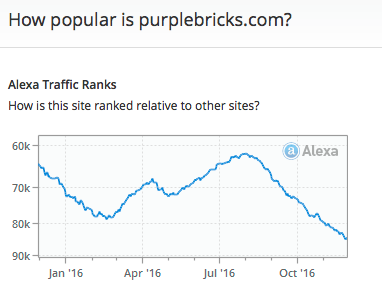 It is a crude tool, as it reveals website data only in terms of global ranked popularity (1st, 2nd, 3rd etc), rather than disclose absolute page views etc. 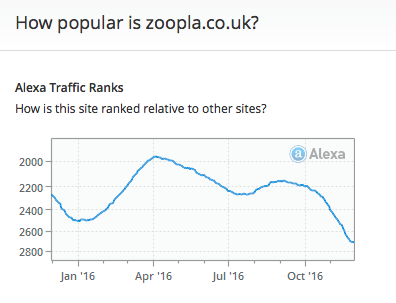 However, the accompanying charts can give a useful indicator of waxing or waning traffic. Too much attention to Presidential election maybe Maynard! No surprises here. A 1.8p per share matches the payments for Q1, Q2 and Q3. The next (Q1) dividend announcement in May ought to be interesting. That payment will be the first for the current 2017 financial year and may provide some indication of whether trading is as subdued as the share price suggests. 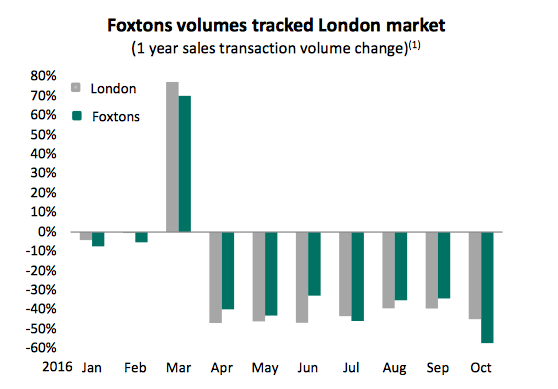 Today’s results from FOXT contained various snippets about the London housing market. 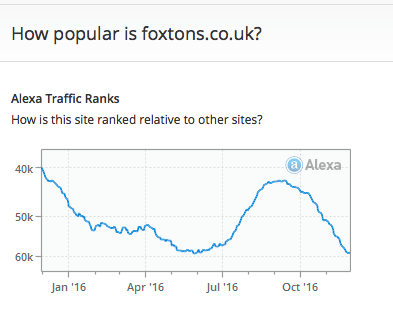 I like to monitor FOXT as the agency is London’s largest and WINK’s business performance has generally tracked that of FOXT up and down. According to FOXT, higher stamp-duty rates and the EU referendum prompted property transactions to slump in the capital during the second half of 2016. FOXT estimates transaction numbers from Q2, Q3 and Q4 were 44% below the corresponding quarters of 2015, and are now running at levels seen during 2009 and the depths of the banking crash. The downturn saw FOXT’s H2 revenue from property sales drop a substantial 38%, from £38.7m to £24.0m. That performance does not bode too well for WINK’s upcoming figures. The table below compares WINK’s gross franchisee revenues (for property sales and lettings) against those of FOXT. Generally WINK’s gross sales revenue is about 45% of FOXT’s, while its lettings revenue is 28% of FOXT’s. During the last three halves, the WINK-to-FOXT sales revenue ratio has improved from 40% to 43% to 45%, so I can only hope that mini-trend continues for H2 2016… and that WINK’s H2 property-sales revenue does not drop 38%. WINK’s ambition is to derive 50% of its revenue from lettings, and I get the impression that target may be reached if WINK has indeed suffered a dismal H2 for property sales transactions. 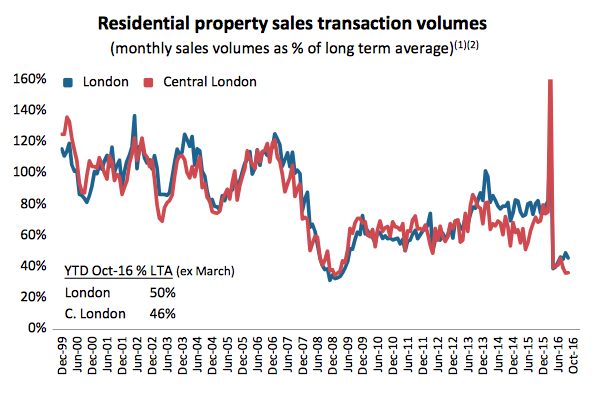 Courtesy of topazfrenzy on the ADVFN boards — a straw to clutch about London property sales (my bold). The second and third quarters of last year were some of the toughest faced by the London property market for a few years, with less people buying and selling as they adjusted to the referendum result and took time to digest what it meant for them and the country. However, this pause in market activity seems to have been only very temporary as Chestertons’ 32 branches all saw a considerable uplift in activity in the last six weeks of the year, with more buyers registering and more sellers looking to sell. That activity has pushed through in 2017 giving us a very strong start to the year with the number of sales up 15% from this time last year, which is even more impressive when you remember that there was a gold rush by investors looking to complete on purchases before the 3% Stamp Duty surcharge was introduced in April last year. “Agents are reporting the prime central London (PCL) market is returning to life, with a suggestion that gazumping is back. A straw to clutch perhaps.